The highlight of April was undoubtedly the magnificent charity whisky auction. To raise £200,000 involves an immense amount of effort from the Auction Committee and Operations Team. The night itself was stunning. Mercers’ Hall was a fitting setting with pipers from the London Scottish regaling us in to the main room. The presence of the Lord Mayor, Lady Mayoress, Sheriff Tim Hailes and Alderman Fiona Adler added to the pomp. The fact that over 40 liverymen and companies had donated lots reflected a great breadth of support for the event. Well done everyone! The April Dinner at Vintners’ Hall was another success. I thought the wines were particularly good on the night. 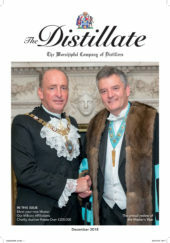 The Spirit and Wine Committee, chaired by Past Master Allan Cheesman, with his able secretary David Hunter, use their expertise to provide us with fabulous wines. You see David prowling Vintners’ Hall as he makes sure bottles are not corked and glasses are filled. I hope he gets to drink as well. The Big Curry Lunch is an annual fixture at Guildhall, where nearly 1,400 sit down for a curry lunch over a number of settings. The proceeds go to a number of military charities and receive great support from the Livery community. There are always many familiar faces. One of the sadder events was the memorial service at the Guards’ Chapel for Past Master Jim Macdonald Buchanan. His father Reginald help set up our Distillers Charity and the family name is still remembered in our Heriot-Watt scholarship. On a happier note was the Beverage Analyst Reunion in the City. This is an annual get together of city analysts organised by Liveryman Ian Shackleton. It is a great chance to catch up with old acquaintances and reminisce about old times. A Master’s role is always tough as I lunched with the Actuaries and dined with the Coopers. I attended a Charity Committee meeting. This Committee is becoming increasingly important, especially after the success of the whisky auction. There are some interesting ideas in train. Two charities immediately benefitting from the auction are: Alcohol Education Trust and their education project for young people in Scotland and Onside Youth Zones, where we are helping to fund a 21st Century youth club in Dagenham, which opens in April 2019. We are also looking to help set up an apprenticeship for an English Distiller and there is a lot of Pan-Livery work, which the Distillers are part of, on a specific philanthropy project, probably Employability. Away from the Livery, I was installed as 838th High Sheriff of Essex, which is going to be a fascinating year working with the public and voluntary sector involved with law and order in Essex.